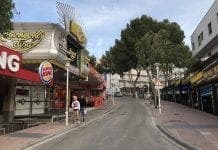 THREE Magaluf workers have been stabbed, and one 28-year-old seriously injured, after a British suspect allegedly went on the rampage. The attack took place around 6.15 am on Tuesday morning close to Punta Ballena. The injured men, one aged 20, were found lying near the beach on Calle Martin Ros García. The most seriously wounded victim was stabbed in the chest and abdomen and found unconscious being being rushed to San Espases hospital. One eyewitness who rushed to the scene said one of the victims ‘was in a bad way’. “I ran onto the beach to try and catch the person who was stabbing people,” bar worker Sean Burnfield told the Olive Press. “The Guardia got one of one of the friends, but somehow the others got away. A Guardia Civil spokesperson confirmed to the Olive Press that one victim remained in hospital. Police believe the main suspect they are now hunting is a tourist. Isn’t Magaluf lovely? Can’t wait to visit!